Men and women in the 29 years and younger race head toward the ocean in last year’s Carlsbad 5000. 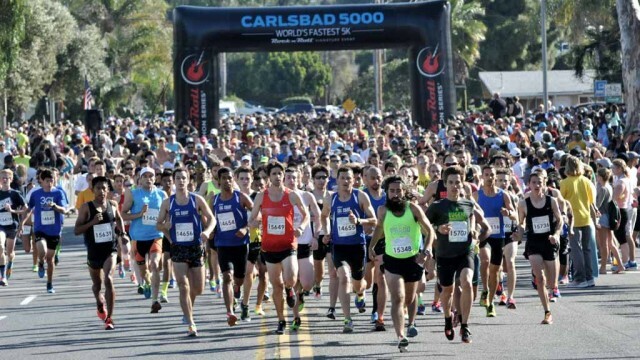 More than 10,000 runners, including U.S. Olympians took to the streets in North County Sunday morning for the Carlsbad 5000 race. Dejen Gebremeskel won first place and Paul Chelimo took second place, with Sam McEntee following in third place for the Elite Men’s race. In the Elite Women’s race, Viola Lagat won first place, Shannon Rowbury took second place and Aisha Praught took third place. In the Master’s Men race, Neville Davey won first place, Jeremy Deere won second place and John Gardiner won third place. In the Master’s Woman race, Courtney Babcock took first place, Julie Ertel took second place and Hilary Corno took third place. For the all-day 20K, Meriah Earle took first place in the women’s race and Scott Hoover took first place in the men’s race. In the 29 and under race, Leilani Rios won first place in the women’s race and Roosevelt Cook won first place in the men’s race. “All eyes will be on a thrilling head-to-head match-up between Dejen Gebremeskel of Ethiopia and American Paul Chelimo,” race spokesman Dan Cruz said, before the event was held. Gebremeskel won the silver medal at this distance in the 2012 Olympics in London. Chelimo won the silver medal at this distance for the U.S. at last year’s Olympics in Rio de Janeiro. Three-time U.S. Olympian Shannon Rowbury headlined the woman’s professional race. She is the American record-holder in both the 1,500 meters and 5,000 meters on the track. It was her third appearance at Carlsbad. The Carlsbad 5000 kicked off at 6:55 a.m. with the Masters Men division. The elite women’s race started at 11:31 a.m. and the men’s race started at 11:53 a.m. as the final event. The race culminated with the “Party by the Sea,” where all eligible runners received a free beer at the Finish Line Festival.